Protect your business and employees against crime. Instead of paying upfront you can expense it monthly. Affordable Quality, Customised for Best business Peace of Mind. The Smart Idea Group is one of the leading suppliers of CCTV, Access Control and related electronic security systems in South Africa. We supply an extensive range of CCTV, Access Control & Intruder detection equipment from internationally acclaimed manufactures. Hikvision’s new DVR and NVR series, both based on a Netra platform, provide dual self-adaptive gigabit network interfaces to benefit your video surveillance system. In terms of multi-address, load balance, network fault tolerance, etc., Hikvision has you covered. A prime example is with multi-address; as before, due to single network interface, previous DVR/NVRs were only able to be connected to one single network. More specifically, two separate clients (or customers) in two dedicated networks (LAN/WAN) were not able access the same DVR/NVR units at the same time. Moreover, if network congestion, network outage, or various other connectivity problems affect one network; video stream data can still be read or written from an additional network throughout another interface. And, speaking of reliability: dual-gigabit network interface ability not only improves system reliability, but also ensures both seamless video recording with load balancing and network fault tolerance. Additionally, load balancing in respect to the bandwidth is also achieved. As such, optimal resource utilization, maximized transfer speed, minimized response time, and avoidance of overload by distributing workload across two network interfaces; while network fault tolerances allow the DVR/NVRs to sustain any possible failure on only one network port – thus providing continuous service and optimal performance to the user! Any organization considering utilizing IP cameras absolutely must choose a product that is both easily installed and easily maintained. As for installation, the initial focusing of the lens generally requires two technicians – one to physically adjust the lens and the other to view the trial-and-error results on a monitor… often through a network connection. Hikvision’s latest camera series incorporating motorized Vari-focal lens with Remote Zoom and One-Touch-Focus functionality directly addresses this cumbersome installation process. The camera allows to automatic adjust the lens focus and is capable of maintaining a clear focus in all zoom ranges using Hikvision’s remote zoom and One-Touch-Focus functions from camera’s user interface (i.e. Video Management Software or IE Client). If the camera loses focus, there is no need to for an installer, or to remove the camera for tiresome manual re-focusing. Remote Zoom and One-Touch-Focus ensures a quick, and accurate, procedure to zoom and focus any image. Without a doubt, when a particular installation involves difficult physical installations, such as height, weather concerns, or unstable physical conditions; Hikvision’s One-Touch Focus and Remote Zoom gives the user an edge that older technology simply cannot match. In shaping the present and future of video surveillance, storage devices like DVRs and NVRs play a prominent role in any overall security system. Obviously, both are used to store large amounts of data and video; hence if a crash occurs – or either experiences disk / power failure – there are potentially huge negative consequences. This is why, at Hikvision, we place a tremendous amount of emphasis on the overall system reliability of both our DVR and NVR components. Additionally, Hikvision’s R&D team continues to devote ourselves on the development of high quality customer-oriented products. A prime example of this Hikvision effort is our new Netra platform based DVRs and NVRs – providing state-of-the-art redundancy to enhance overall system reliability. Our Netra platform offers both a primary operating system and a backup. In the event of a main system crash, the back-up system is automatically activated, allowing the DVR to continue recording. Another feature is our RAID disk array technology. This feature protects data security and enhances storage capability by employing RAID 0, 1, 5, 10 disk management across 16 hard drives. Additionally, dual power capability also improves system reliability and ensures seamless video recording. Today’s video surveillance industry is in the middle of a paradigm shift. With the increasing popularity of Internet Protocol (IP) cameras, it is believed that the market is shifting rapidly from analog to IP video surveillance technology. This transition is spawning rapid innovations to increase the capabilities of video surveillance systems. One such example is the advent of NVRs offering a choice between standalone units or recorders as part of a PC assembly .This development in the NVR poses the question: should clients opt for an NVR that is PC-based or a self-contained, embedded unit which only requires attachment to an Ethernet-ready interface? Unlike a PC-based unit which is likely to run a range of Windows™ applications, an embedded NVR benefits from the stability that comes with Linux code which is optimized to run only applications relevant to the surveillance tasks required. An embedded operating system contains only the software components necessary for the specific functions of the NVR, and the unit will be supplied with optimum configurations straight from the factory after rigorous testing. The precise architecture of the embedded NVR units makes them less prone to crash. However, the PC methodology for NVRs is certainly ‘open’ in terms of the addition of external storage, installation of software etc. The controls are embedded into the NVR; they are an integral part of the panel rather than an adjunct, and the activity of operators can therefore be more easily restricted to legitimate usage. Beware of the curious security guard – This scenario is exaggerated but only slightly. Find an integrator or end-user that is willing to be honest with you and they may well describe situations such as the following. It is all too common for a bored security guard who sees a Windows™ logo on a PC screen that he is monitoring to think: “I know this environment. I play games on it at home. I could play Solitaire on this and if I just uninstalled that program I would release enough room to install ‘Battlefield 2.’ And I guess I could plug my USB-driven phone into that port over there.” Cases of a staff member plugging a phone into a surveillance installation and taking out a whole security system are common. No amount of foresight can anticipate unpredictable behavior by junior staff. But the contrast with an embedded NVR is obvious. There is little scope for attaching foreign devices to the panel and any such device will not be recognized by the NVR. Recent years, the camera’s image performance during night /low light conditions has been greatly improved in video surveillance industry; nonetheless legibility under wider array of light frequencies is still a consistent impediment for the ever-demanding details detection. A good example is the vehicle’s detection during night, as the image (1) described, conventional camera’s lens may suffer serious glare interferences while a vehicle enters the target field of view. Here, the vehicle’s detail such as its license plate is not visible. To a certain extent, a small vehicle’s headlight can easily outfight the whole surveillance system at this critical moment. With continuous effort on image quality enhancement, Hikvision HLS (High Light Reversion) technology is developed to solve this issue. As the image (2) referred, HLS technology is able to decrease maximally the glare disturbance such as the vehicle’s headlight, making the entire video surveillance system more vital during the night monitoring of moving vehicles, especially in terms of parking lot management, access controlling efficiency, intrusion detection etc. Transportation is part of nearly everybody’s daily life; people use vehicles for work and leisure travel, schools dispatch buses to pick up students and send them home, logistics companies use vehicles to deliver goods. We can say the very fabric of society – people and assets – are being transported from one place to another every minute of every day Securing them is obviously extremely important. A mobile DVR has one of its prime roles in helping to secure such situations, protecting people flow and assets and ensuring the safety of traffic environments. Many customers confuse mobile DVRs with regular DVRs, Though the functionality of a general-purpose DVR and a mobile DVR may be similar, it is not a case of “one type fits all.” The comparison is more like adapting a novel into a movie, where different uses create different possibilities. A mobile DVR is specifically designed for vehicles, such as buses, armored cars, subway trains, etc. A good quality mobile DVR can record for a continuous time without failure; it can withstand the frequent vibration and unstable power supply associated with vehicles, factors which are fatal to a regular DVR. It can provide evidence of traffic accidents and terrorist attacks while uploading alarm information to a control center in emergency situations. A good quality mobile DVR will also have a long life span and give stable performance, which helps customers to reduce maintenance costs. The main difference between a regular DVR and a mobile DVR lies in the environments in which they are meant to be used. We give here five factors which define an appropriate mobile solution: power supply, anti-vibration mechanism, dust prevention and heat dissipation, solid interface and data transmission. As a mobile DVR can only be located on the vehicle, its power supply must be drawn from the vehicle as well. In vehicles, the voltage is currently 12V, 24V, 110V, and is not as stable as that of indoor locations, especially during engine start-up and braking when voltage can fall to 9V or less. This creates a very unstable power supply. Electronics are very sensitive to power surges and spikes, and equipment fails quickly if they are not handled properly. Additionally, the mobile DVR acts as a hub that stabilizes power for sensors and cameras. However, some manufacturers use low-quality power supplies to reduce costs, but this inevitably shortens the life span of their products. So, indentifying a mobile DVR with an excellent power supply is crucial. Here we list some international standards relating to power systems for your reference: ISO 7637-2: 2004, JASO D001-94, SAE-1455. Customers can refer to these standards when buying mobile DVRs. Since vehicles are constantly in motion, vibration is inevitable. Constant vibration leads to mechanical failure if it is not considered during design. One of the factors that sets rival products apart is the materials used for anti-vibration mechanisms. Most manufacturers use rubber to contain vibration since use of rubber lowers production costs. However, it deteriorates over time. Generally, rubber guarantees performance in short time frames but is susceptible to heat and cold, which softens or hardens the rubber. Higher-end mobile DVRs use wire rope, which ensures performance regardless of external factors. Mobile DVRs are generally installed in confined spaces and compartments. This exacerbates the problem of heat dissipation because mobile DVRs are required to operate for a long time in such a confined environment. The challenge here is twofold. If you try to fit fans to the DVR, you will inevitably leave an opening in the enclosure and make it more vulnerable to dust. For this reason, fans are not acceptable for mobile DVRs, and an alternative approach must be considered. Aluminum is the preferred material for enclosures as it allows heat to dissipate even when it is completely sealed in. Low-cost mobile DVRs may use aluminum alloys instead of pure aluminum to reduce costs, but they will prove incapable of handling dust and heat adequately. Due to the constant vibration on and within vehicles, a solid interface which combines devices is crucial to ensure a continuous and stable running environment. A BNC interface is standard for regular DVRs but it is not suitable for mobile DVRs since the BNC interface can easily loosen due to frequent bumps. A high-end mobile DVR adopts a solid aviation specification interface, it can sustain vibration, ensuring continuous transmission of power, signals and other data without failure. However, some manufactures use a common aviation specification interface which is not eco-friendly and is not sufficiently solid; such interfaces can easily break down over time. In the past, transmission was the weakest link for many mobile DVRs but this has changed due to advances in wireless technologies. Previously, innovation in mobile DVRs was slow as the limited transmission options constrained how manufacturers could add value for users. Even Wi-Fi was not as significant as some thought it would be due to its Bandwidth fluctuation. The availability of 3G networks has enabled a wide variety of new functions. For example, it was not previously practical to transmit data collected from the vehicle in real-time, such as video, location, brake signals, speed and inertial measurements. However, all of this can be achieved in a mobile DVR. The above advantages and features have seen mobile DVRs being widely used in the transportation sector, Mobile DVRs are surely the best choice for mobile surveillance due to their professional design for use in vehicles. In view of traffic accidents, legal mandates have been formulated to strengthen surveillance protection. For this reason, the potential mobile surveillance market may become very large. Customers should be aware of the features of mobile DVRs, selecting appropriate solutions in different applications accordingly. 1. Provide hardware decoding. This function is usually applied on network clients, when compressed data stream is transmitted to them, and decoded by the MDI card; or be used for local file playback. Under such occasions, the aim is to decode without occupying PC CPU resource. The decode result of each input channel can be output to any divided part of monitor displays, and screen switching and sub channel functions are also supported. For DS-4002MDI card, there’re 4 decoding channel with 2 output channel, which means it can decode 4 channels, and has 2 analog output channel. The 2 analog output channels can be output to 2 analog monitors, each of which has up to 16 screen divisions. Each decoding channel supports 1 channel VGA display and 2 channel Monitor display. Note: For each output channel, it can output the decoding data either from the card it belongs, or other MDI cards plugged in the same PC. For instance, if there’re 4 DS-4002MDI cards plugged in the same PC, then each card can decode 4 channel video, added together 16 channels in 1 PC, and all the 16 channel decoding results can be output via only 1 output port to a monitor display, and each channel refers to 1 of the 16 screen dividing area. Vice versa for DS-4008 MDI card. 1. Analog video signal input by video camera. 2. Real-time video stream acquired through network. The real-time network data stream can be the H.264 bit stream that transmitted through network from PCDVR (DS-4000H/HC), embedded network DVR of DS-8000 series, or DVS of DS-6000 series. 3. Video files stored in local hard disk which is decoded by DS-4000MD. The files here can be either local video files or internet downloading files. 1. Support both video and audio switching. 2. Each video output supports screen dividing and sub channel function, and the location of each window is dynamically adjustable. 3. It can switch and output any video input source of any type to an arbitrary window of any channel for display. 4. The output switching video supports 4CIF, DCIF, 2CIF, CIF and QCIF resolutions. 5. Support switching output of multi-channel audio, and each MD card supports 1-channel audio preview output. 1) Cost advantages: You can form a small video matrix system by only a PC and a DS-4000MD card. If the DS-4000HC card is added, then the video matrix can be merged with DVR, which will bring lower equipment costs, convenient installation and commissioning, high integration, strong stability and low maintenance costs in future. a) Powerful functions and flexible configuration: All the functions are based on the PC platform, and set by users as they like. DS-4000MD cards (based on the network or documents) can form a simple hardware-decoder platform or an output system of multi-channel decoder (maximum 64) + matrix independently. DS-4000MD and DS-4000HC can form a DVR+ video matrix system. The above-mentioned two modes can be used together, which is: local real-time video + hardware decoder + video matrix, and the 3 functions can be used in different constitutions. b) Easy operation: All the operations are based on PC platform, and completely controlled by user’s application programs. c) High integration and strong stability: New design of hardware system reduces the loss of power consumption, and enhances the stability of the hardware. 3) Powerful image processing function is much better than the simulated matrix. a) Image quality is guaranteed by 4CIF output resolution of matrix output. b) Rich image processing functions: User-defined screen dividing, sub channels, user-defined image display, OSD, LOGO, etc. c) Rapid image switching, smooth display and strict synchronous switching process without losing frames and dislocation. d) What you see is what you gain. The output content of matrix is the same as the content of video. a) H card, HC card and new MD card are supported in the same SDK, and mixed using is supported, too. b) Compatible SDK simplifies the development and implementing process for users. c) Speed up the customer development by proving DEMO program and its source coding. The 64-channel DVR system consisted of DS-4000HC is the same as current card program. And with 2 added DS-4002MD to complete the analog output, video matrix can be achieved. It can form 64-channel decoding system, and support 32-channel analogue video output at the same time. It can also form flexible models of video output by different screen dividing. Remote network terminal can adopt PC-DVR consisted of Hikvision H card and HC cards, or Hikvision embedded DVR/DVS. DVRs have seen fast growth, shifting to products that offer digitization, networking and intelligence. That said, today’s DVRs are still pretty basic, and they are struggling to catch up as more network and intelligent applications appear. Regardless, DVRs will remain mainstream video surveillance products. In order to meet the more and more challenging requirement from the market, Hikvision developed the next-generation DVR – DS-9016HFI-S Intelligent Hybrid DVR based on a completely new structure. It is more powerful and delivers better performance, while catering to new demands. This is not a revised design based on an older model. This is real innovation. The new series DVR features a new ARM 9 RISC processor along with TI new-generation DSP DM647 and 648 DSPs. The new processor has higher capability that enables greater flexibility. In addition, DM647 and 648 DSPs have more powerful multimedia processing; a single DSP chip independently allows 8 to 10 channels of 656 video input — capable of multichannel video input encoding and intelligent video analysis. While the security market stepped from analog to digital, and now into IP, DVRs also have to move into this direction accordingly. Given this into consideration, the DS-9016HFI-S Intelligent Hybrid DVR also features more powerful networking that supports Internet protocols, PNP and remote IP address configuration. The next-generation DVR also offers two-kilomega Ethernet ports, which are capable of high-speed video transmission and download. The new DVR has a newly designed in-display, which encompasses advantages of PC-based DVRs. It offers high-resolution image ports, enabling 1,280X1,024 pixels or 1,024X768 pixels on VGA display. This function not only restores true-picture images but also decodes network camera image in high resolution. Moreover, the high-definition video is not only in real-time display, but also in playback. Hikvision’s new product has an aesthetic, practical control panel that combines the channel indicator display and keypad for alarm view. It supports mouse and shuttle switch, and features a new OSD design with a Windows operating system. All functions can be easily operated by one single mouse or shuttle switch. It also supports clear guidance for configuration. DS-9016HFI-S Intelligent Hybrid DVR also has higher security performance, such as power consumption and RAID, to prevent hard-disk malfunction. Besides supporting standard algorithms for video and audio encoding and decoding, a Linux operating system is embedded. This enables Hikvision engineers to not only master operating details, but also customize and install software. Inner modularization is an added plus. 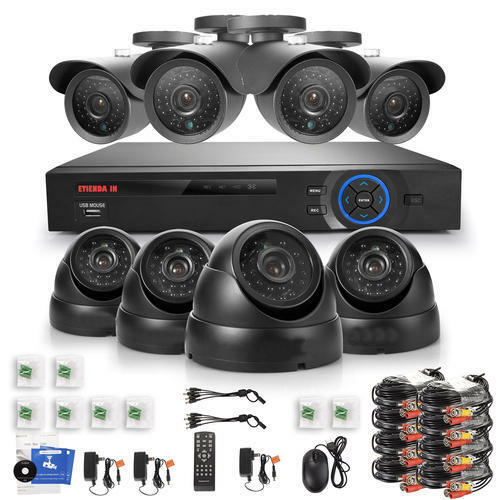 Support IP camera with resolution up to HD 720p (1280X720), as well as support analog cameras and IP cameras simultaneously in two ways: sixteen analog cameras plus eight 4CIF IP cameras, and sixteen analog cameras plus four mega pixel IP cameras. Support digital zoom in preview and playback mode. Support maximum hard disk drives capacity (more than 2 TB). Recorded file can be locked in order to prevent the data from being overwritten. Locked file can also be unlocked. HDD can flexibly be set in redundant mode, read-only mode, or read and write mode. Easy to manage backup device by formatting, creating folder, and playing recorded files in backup device. Support remote downloading with resuming capability. Manage and configure IP camera (ex. compression parameters, motion detection, and sensor alarm) locally on DS-9016HFI-S Intelligent Hybrid DVR. 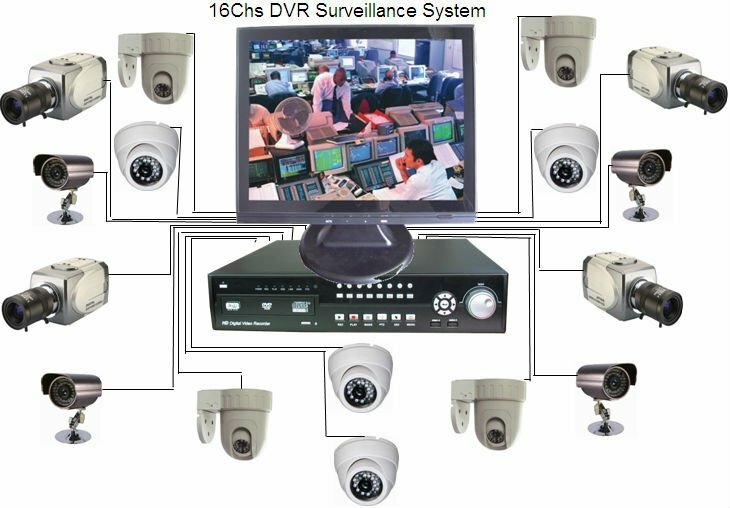 PC-based DVR systems have become the choice for surveillance system integrators and users due to their higher scalability, flexibility and ease of customization. However, choosing a hardware compression system or software compression system can make a big difference. PC-based DVR systems appeal to system integrators and users because of their unique flexibility and scalability. By adding more compression cards, the system can support more video channels, and desired functionality can be achieved by adding daughter boards. 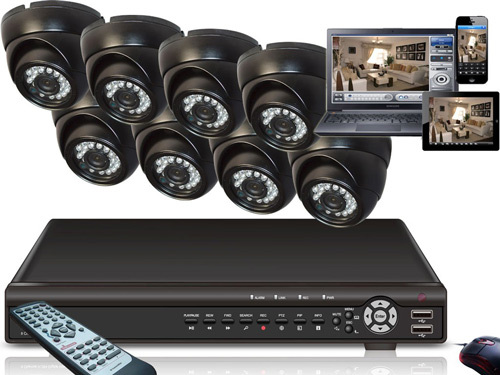 In addition, the provided SDK allows the DVR system to be customized to meet specific requirements. 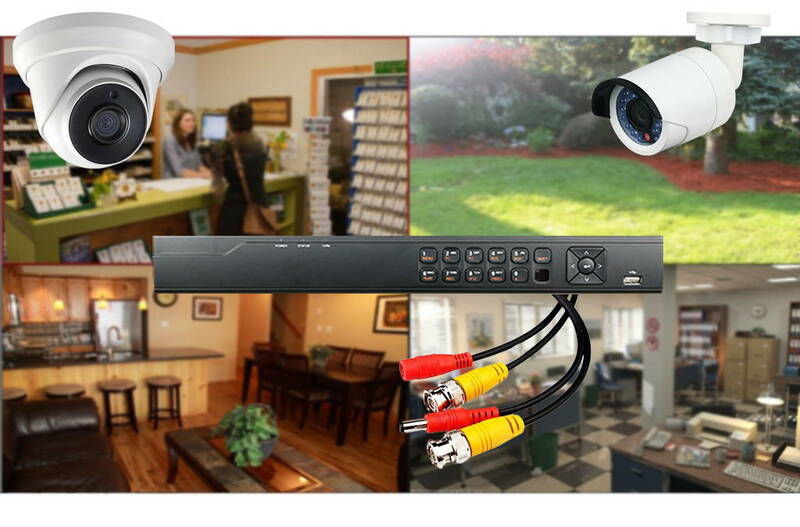 A PC-based DVR system captures surveillance video in real-time and saves it to your hard drive. To do this, it has to gather the signal, and compress it, and save it to a video file on your drive. Every card captures a certain number of frames per channel (for example, a 16-channel card that captures 100 frames per second in total, captures 6.25 per channel, whereas one that captures 400 fps, can capture 25 per channel). Then, the system must compress it and save it. Either using a software process, or the DVR card itself does it. It’s important to note that a PC-based DVR system can be made using either a software compression card or a hardware compression card. As the name suggests a software compression system (SCS) uses the card to capture the signal, and software to compress it. It’s your computer’s CPU and RAM that do this work, which comes at a high cost of your system resources. A hardware compression system (HCS) not only uses the card to capture the signal, but will also compress it. It will have one or more chipsets on the card that are responsible for capturing, compressing and saving the video to the hard drive. The biggest problem of software compression DVR system is CPU Loading. This means that your computer’s CPU, already busy with other things, is being heavily used by the DVR system. This may not be a problem with DVR systems running at a lower frame rate, but with faster, real-time systems, where the processor has 400 4CIF images to compress every second, the CPU can quickly max out. Why is it a problem? There are several reasons. First, not all frames are the same size, nor they do not all require the same amount of work to process, which means the workload varies constantly regardless of the compression codec being used. Also, the CPU is busy processing other things like GUI (graphic user interface) changes, playback functions, motion detection and network operation, to name just a few. With the CPU under such heavy use, several large frames in a row can cause serious problems. With the normal operation of your PC you see this all the time. One process simply waits its turn at the CPU, so you’ll see a window take extra long to redraw, or the screen will take longer to refresh. This is not normally a problem. But with DVR operation, such ‘traffic jams’ are bad news. At 400 frames per second (4CIF resolution), you computer gets overloaded pretty quickly and starts to drop frames. Frame drop means gaps or ‘blips’ in your recorded video and audio artifacts. You may not notice occasional drops, but if your CPU drops more than a few, you will see it. In severe cases these traffic jams can cause your computer to crash completely. Because a hardware compression DVR system uses its own chips for compression, the load on the computer’s CPU and RAM is a great deal lower; frame drops almost never occur on these systems. A hardware compression system has one or more chipsets on the card that are responsible for capturing, compressing and saving the video to the hard drive. This means it has good performance coupled with low PC CPU and RAM resource requirements . For this reason a hardware compression DVR system is far more stable than software compression DVR system. And because hardware compression cards usually use high performance chipsets to compress frames, the compression process will not be affected or interrupted by other programs. It brings more fluid video image to customers. Meanwhile, with a low CPU occupancy rate, hardware compression system can easily accomplish additional functions by using spare system resources of computer, such as intelligent analysis, license plate recognition and so on. Network connection performance can be better as well, in particular fast transmit speed and multi-channel simultaneous connection. Hardware compression systems can also easily support up to 64 channels in one PC with real time monitoring and real time recording (every channel is 25fps in PAL or 30fps in NTSC). Most software compression system supports only 16 channels.